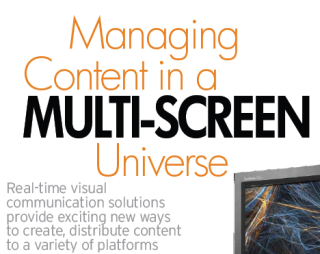 Our multi-screen world has fostered numerous challenges for content creators, managers and developers. While consumers demand high editorial and production standards delivered in real time, developers are faced with obstacles as they struggle with various tool kits, formats and resolutions for creating and delivering dynamic content to an ever-growing number of multi-platform devices. But by leveraging today’s real-time visual communication solutions, content producers can access exciting new methods for creating, managing and distributing content to a variety of platforms and screen types. We now live in a world where multiple devices are commonplace, and users are consuming content at their desktop, mobile phone or tablet, via a digital sign or on YouTube. More than ever, it has become crucial for content to effectively reach all these devices in real time. Some content producers choose to distribute the same content across multiple platforms, with few or no modifications, which often results in less appealing and effective messages. After all, content that works beautifully on a large plasma screen will most likely not translate to a mobile phone. It is important to be aware that layout, font size, imagery, pace and the overall graphical experience will not reformat properly or work on various screen sizes. Likewise, audiences on other screen types experience content differently and expect a presentation that is geared for their device. This forces producers to create unique content for each device, adding significant cost to the content production process. The ideal solution—balancing efficiency with creativity and optimization—lies somewhere in the middle. The best scenario will allow users to select key individual content elements that make up a project and take advantage of automated processes, repurpose the content and rework it into formats that are optimized for the target device while creating the very best user experience. Corporate communicators, retailers, universities and governments are realizing that their audiences access and interact with content in a variety of ways. They understand the important roles that social media, user-generated content, real-time data and rich-media content play in keeping audiences engaged. They equally appreciate the need to present a consistent, branded message to audiences or risk getting lost in communications clutter. Resolving these challenges, along with the technical issues involved in creating and delivering to different devices, is incredibly demanding. But with proper planning, it is possible to implement a successful multi-screen strategy that satisfies even the most demanding of communicators. Stepping up to the challenge begins with examining and optimizing the content workflow and inserting automated processes wherever possible. Every step of the way, content creators must look for processes that are repetitive and be willing to create scripts that accomplish tasks without human intervention. This allows content managers to realize efficiencies that accelerate and streamline the content creation process while maximizing the ability to distribute content to various screen types. This results in significant cost savings while dramatically improving communications opportunities. Leveraging template-based tools will give content creators of all skill levels the ability to create professional-looking, dynamic content quickly and consistently. Pre-created “smart” templates and objects that are connected to production logic, real-time data sources, graphics and other elements provide producers with incredible creative flexibility to build complex media channels easily. Take this concept a bit further, and even the layout of content can be rearranged dynamically based on the form factor of the target device. This is especially important as content creators choose to modify their projects while requiring that they work effectively on a different platform. Though a single universal standard is not a reality, automated format conversion is another solution that can be implemented to help overcome the challenge of multiple formats. By processing media according to preset rules, tedious, time-consuming tasks can be minimized. Staff can then be freed up to contribute their time and talents to the creative process. When this type of automation is taken another step forward, it can support dynamic video format conversions according to the screen on which content will play. Distribution can also be automated by publishing to specific devices or groups of devices according to a predetermined schedule. Distribution can be based on preset rules that take demographic or geographic factors into consideration. A centralized traffic tool will serve to manage content and send it out to the right audience, at the right time, utilizing the right format, onto the right device, thereby optimizing the communications effectiveness of the messaging. Communication professionals understand that their audiences are now consuming content via multiple devices. Producing, managing and distributing multiple versions using multiple manual processes in parallel simply doesn’t work. It is only by taking full advantage of automation, advanced templates and preset rules that the process can become efficient and effective and drive ROI. A real-time visual communications solution must be able to accomplish this while guaranteeing creative flexibility, consistent branding and impactful messaging across any screen, anywhere.